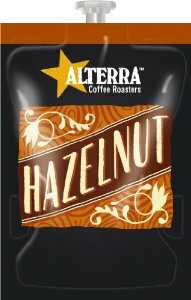 Indulge yourself with a perfect ALTERRA COFFEE ROASTERS, Flavia Hazelnut Coffee. Enjoy a luxurious blend of medium roasted beans and the continental flavour of hazelnuts. Fast Drinks vending are your first choice for secure Internet ordering and FAST delivery of ALTERRA Flavia Hazelnut Coffee refills. We are a leading Flavia supplier based in the UK. Our prices are often the most competitive on the web and we are proud of our outstanding on-going customer service and support. Great value-for-money Flavia Refills and Sachets. Delivered from stock straight to your door! Fast Drinks deliver an unrivalled vending machine ingredients and supplies order and delivery service. If you are looking for a 24/7 fresh food access then look no further! We are a fast growing vending supply specialist and stock many of the leading brands and solutions including In-Cup, Singles, Bulk and fresh Bean Coffee. We can help you with various vending products such as chocolates, crisps, bottled and canned drinks, Flavia and Klix refills, tea and coffee supplies for all kinds of vending machines. Fast Drinks vending are your first choice for Flavia coffee Refills. We stock and deliver to your chosen destination Flavia coffees, tea, hot chocolate, tokens, cups etc., all available to purchase today online - at the very best prices. We also pride ourselves on our levels of customer support and service. As your regular supplier of Flavia drinks and ingredients we can ensure that your stocks are always at the desired levels, enabling your business to operate smoothly. Read more: Flavia Coffee. KLIX® is the UK’s number one in-cup vending solution. Our comprehensive range of KLIX drinks and cups are supplied and delivered by the dedicated Fast Drinks team. The KLIX range is particularly appreciated by those with a taste for great tasting hot and cold drinks. Their stylish, slim-line design always looks smart in any setting! Our Nationwide coverage, great service and reliability enable Fast Drinks to stand-out from the competition for KLIX drinks supply. Read more: KLIX Drinks.